Ian poses with some rather bizarre signs. Rather than address a theft problem, this park merely posted a sign warning tourists that their cars may crushed by giants wielding large crowbars. 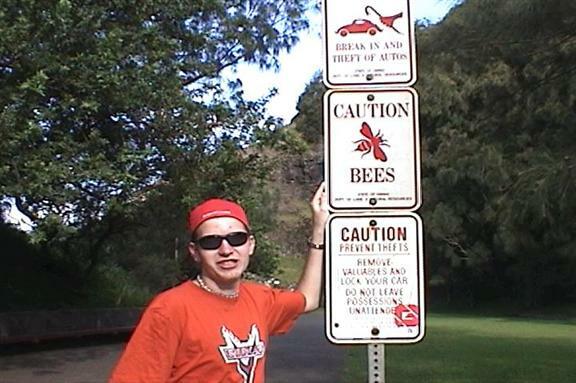 I also like the bees sign, because its obviously printed on a blank for a parking sign. What good does warning drivers about bees do once they're at the park? You get out, and you see a bee. What are you gonna do, run for your car seal off the window cracks with duct tape before driving off? Undeserving of a road sign posted as such!